Inflammatory Bowel Disease (IBD) is a group of chronic disorders that cause inflammation or ulceration in the small and large intestines. Most often IBD is classified as ulcerative colitis or Crohn's Disease but may be referred to as colitis, enteritis, ileitis, and proctitis. 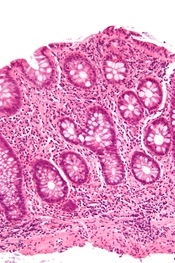 Ulcerative colitis causes ulceration and inflammation of the inner lining of intestines while Crohn's disease is an inflammation that extends into the deeper layers of the intestinal wall. Ulcerative colitis and Crohn's disease cause similar symptoms that often resemble other conditions such as irritable bowel syndrome (spastic colitis). The correct diagnosis may take some time. 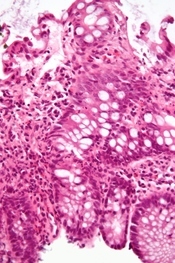 Crohn's disease usually involves the small intestine, most often the lower part (ileum). In some cases, both small and large intestine are affected. Sometimes, inflammation also may affect the mouth, esophagus, stomach, duodenum, and may recur at various times over a lifetime. Some people have long periods of remission, sometimes for years, when they a free of symptoms. The most common symptoms of Crohn's disease are abdominal pain, often in the lower right area, and diarrhea. There also may be rectal bleeding, weight loss, and fever. WriteWork contributors. "Irritable Bowel Syndrome." WriteWork.com. WriteWork.com, 24 September, 2003. Web. 26 Apr. 2019. Intro to Pyschology mid term. Work Related Stress -- what it is and to combat it.